Last week a group of our Marianist high school students travelled to the Marianist University of Dayton for a college visit. The visit was a very positive and grace-filled event for all those who made the journey to the Midwest. 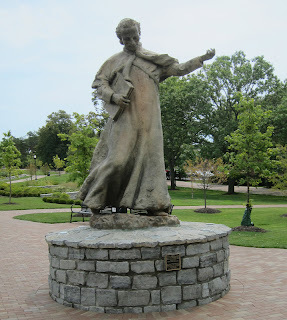 During our stay at the University of Dayton we stopped and prayed at the new statue of Blessed William Joseph Chaminade. Donated by President Daniel J. Curran and Claire Renzetti as “a gift of thanksgiving for the Marianists,” the statue by UD alumnus and Marianist Brother Joseph Aspell (’68) was commissioned in honor of the 250th anniversary of Blessed Chaminade’s birth. The UD sculpture is one of four: two smaller versions are in the provincial offices of the Society of Mary in St. Louis and at St. Mary’s University in San Antonio, and the fourth will be installed at Chaminade University in Honolulu. Blessed Chaminade, a French priest, escaped to Spain during the Revolution after refusing to take the Oath of Fidelity all clergy were ordered to swear. When he returned to Bordeaux, he brought together an eclectic group of merchants, priests, teachers, chimney sweeps, former soldiers and others from all walks of life who drew their inspiration from Mary and believed strongly in service to youth and the poor. They became the Society of Mary, or Marianists.